CenterPeace is a gathering place for people from all walks of life, all faiths and all spheres of society. It is a Community Center where we come together and share our Wisdom and support each other. Education, Apprenticeships, Mentoring, Events, and Concerts, allow experiences and opportunities to abound at CenterPeace. Within this space dedicated to a ​Culture of Peace - ideas, education, inventions, artistic expressions, and nonprofit business models flourish. ​The Event Center will be CENTERPEACE’s main feature. A beautifully restored 1937 US Forest Service Building is available for concerts, weddings, fundraisers, corporate parties, private functions and more. Events will raise awareness of humanity’s state of consciousness, our past – present – and future. Educational programs will be offered to groups and schools with a variety of subjects. Also included are events that feature the wisdom of Indigenous People all over the world, beginning with our local tribes. Youth Hostel and Education Center provides onsite housing and education for youth enrolled in the University of Heartistry programs. Each student will have the opportunity to learn through service, classes, mentoring, and personal project development. Students are support staff for the various Centers on the property and have the opportunity to build skills while learning their trade. The Nonprofit Development Center will be an educational space where CenterPeace is nourished and managed. Housed in one of the outer buildings, the Nonprofit Development Center will train students, interns and apprentices while implementing the fund development campaign for property restoration and development. On the job training gives an added value to an educational plan while giving the Nonprofit Development Center staff to implement programs and activities. Apprentices and Interns learn the ins and outs of the nonprofit world while providing services to the nonprofits coming for help and training. Nonprofit experts guide, mentor and train executives, staff and Boards of Directors. Students will search out grant opportunities, fundraising activities, and learn all aspects of starting, grounding, nurturing and harvesting the seeds of service. As CenterPeace project advances, the Nonprofit Development Center’s services and programs will expand to provide educational programs for small nonprofits in existence. Continual education, support services and mentoring will aide organizations who need a hand to make the next step into their own mission and vision. Peace Production’s program Tink’s Umbrella will then fiscally sponsor students who excel and go into the world to provide their service and calling to humanity. Students who are fiscally sponsored for their own projects will also participate in the Media Arts Center’s Futurementory Film process where they create their dream on film and have the film as a guide for future growth, mentoring themselves into their own dream. The Media Arts Center will be housed in one of the external buildings. Media Arts professionals will train students, apprentices and interns in all aspects of media for marketing, promotion, development, fundraising, and filmmaking. Apprentices and Interns create content for the Nonprofit Development Center as well as a fee for service offered to organizations and businesses. The TREE Center (Tree Responsible Environmental Education) will feature a timber museum type educational and interpretive center and display. Native trees and plants grow all around CenterPeace grounds and a walking tour will be developed. The grounds will include features such as a Food Forest, Edible Garden, Healing Garden, Sculpture Garden, and a Musical Garden with a play space for Elders and Youth. The history of our forests, forestation, and forest stations will be shared in a holistic way that encourages each person to consider the future as it relates to Oregon’s Trees and Forests. Sand Mountain Society is responsible for restoration of US Forest Service Properties and would use CenterPeace as their base for equipment and training. Some restoration activities would be held onsite. The Art Center provides space for artist studios and education. Artists rent space for individual or shared studios. Master artists could share their wisdom with apprentices and interns through CenterPeace’s educational programs. The Indigenous People’s Center supports our local tribes (especially Grandmother Agnes Pilgrim of the 13 Indigenous Grandmothers) and provides a venue where cultures from all over the world will share their wisdom, art, medicine, cooking, dance, history, and spirituality. Each month a new culture is featured. During the week classes are held teaching the indigenous way of life presented. On weekends, events such as Living History re-enactments, dances, performances, dinners and auctions for their handicrafts bring attendees from all over to Grants Pass. A new culture every month ensures return clientele to CenterPeace. As we learn of other cultures, we all become more compassionate with one another. The Healing Center offers a variety of natural healing methods with classes in nutrition, herbal healing gardening, mindfulness, breathing practices, and holistic modalities. Retreats, classes, individual and group healing activities, and health education support a thriving community. · Land consists of 3.32 acres subdivided into 22 residential lots with a street and two alleys. · All structures appear to be solid buildings with foundational integrity built of old growth timbers in excellent condition. · No dry rot, termites, or mold were observed in the walk through. Engineering report by Restore Oregon in hand. · Center Structure is approximately 5,000 sq ft of open space. · Windows are broken in some buildings. · A fire occurred in one building due to homeless individuals trying to stay warm last winter. 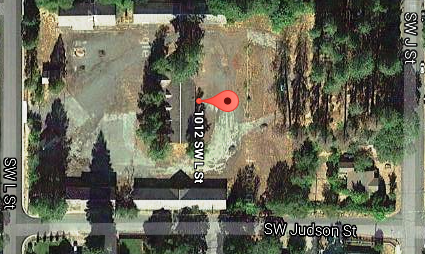 · The property is zoned residential and could include nonprofit, education or church activity. · Interior walls in exterior buildings are not load bearing and could be rebuilt from the shell. Peace Production, a 501c3 nonprofit, recommends a broad spectrum community based support to turn this surplus property into a thriving community space that offers gathering places, education, and more. Using the model of Rhineheart Park where the public funded building the park, fundraising activities would begin as soon as the property is secured. Ideally, a group of individuals would come together to purchase the land and place it in a land trust to preserve it for future generations. Alternatively, individual purchaser could lease it to the nonprofit for 100 years, enabling future security. The lease could start at $1 a year until up and flourishing at which time the rents could increase as programs and events grow. By using Barbara Marx Hubbard’s pattern of the Wheel of Co-creation, support for a variety of onsite projects is spread throughout the community with the 12 sectors of society. When the 12 sectors are working in harmony together for the greater good of all, the pattern emerges with an energy field that flourishes and grows beyond sustainability. Purchase of the property will range between $200,000 and $300,000 we presume. Rebuild of The Event Center would begin with restrooms, wood floors, new windows and roof and multi-media technology. Other buildings may be ‘mothballed’ until funds are brought in for specific uses; e.g. renters found or projects determined for specific spaces. The Sustainability Model: Diversity is key for continual funding for The Center. Several streams of income will allow the programs to operate collaboratively. The University of Heartistry programs provide an educational base for students living onsite in the youth hostel. Youth provide labor in exchange for housing and education. The community feeling and experience will also support the neighborhood with volunteers helping elders and the poor housed nearby. Phase I: Obtaining property, evaluating space usage, establishing long term development plan, creating partnerships and preservation plans, developing programs and alliances. Phase 2: Property development, fund development campaign launch, program development, construction & renovation of space. Phase 3: Program implementation, space rental, community growth and PLAY!